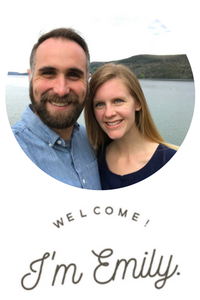 We subscribed to Taste of Home for a short stint when I was in Jr. High. I spent endless hours reading every single word of those magazines. Pouring over pages full of delicious, not so health conscious recipes was the beginning of my cookbook obsession, I think. My favorite column in Taste of Home was, and is still, My Mom’s Best Meal. Readers share the recipes that showcase their mom’s best home cooked meal. There’s heritage and story, flavor and tradition in each column’s tribute to a mom and her best meal. The selected recipes speak of time around the table, of hospitality and love. Though I no longer get a Taste of Home in my mailbox every month, I’ve often considered what I would choose for my mom’s best meal. My mom is a phenomenal cook/baker/entertainer so I have plenty of options. However, I keep returning to one meal – comfort food at its best – that was a staple in our home growing up. In the coming weeks, I’ll be sharing my mom’s best meal, one recipe at a time. I’m starting today with my mom’s applesauce. More often than not, a jar of Mott’s Cinnamon Applesauce graced our table. It was an especially good accompaniment to pork chops and rice pilaf (another favorite meal of mine). 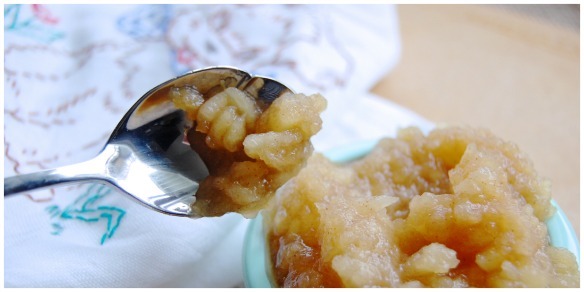 It was a huge treat when mom made applesauce from scratch. 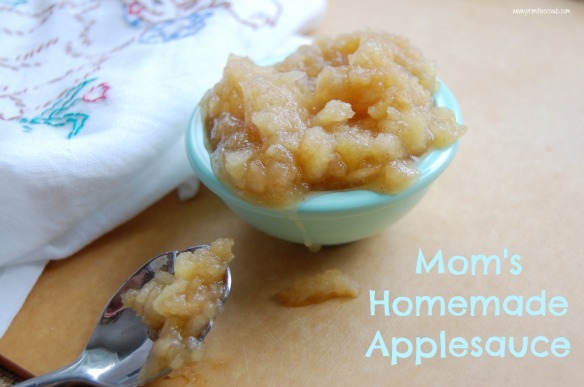 When my mom explained the process, I was shocked to find out how easy it was to make your own applesauce. The hardest part is peeling the apples and that’s more time consuming than difficult. 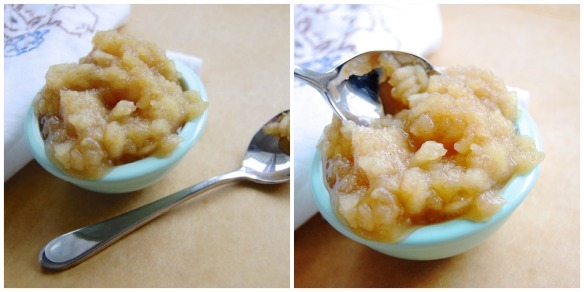 The time is a small price to pay for the fresh, pure taste of homemade applesauce. Now, this isn’t a condiment like the Crockpot Apple Butter I shared in December, which you can spread on anything. 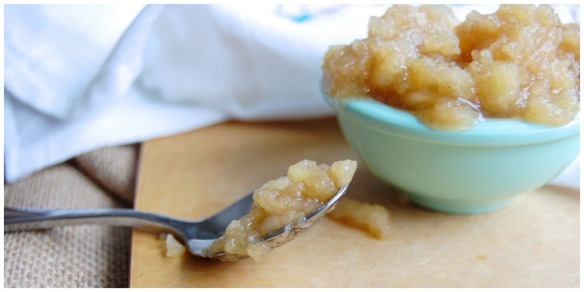 Homemade applesauce is chunky and fresh compared to a concentrated, thick apple butter. This is a perfect side dish for any meal and when you make it yourself, you can feel good about feeding it to your family – from babies to grandparents. 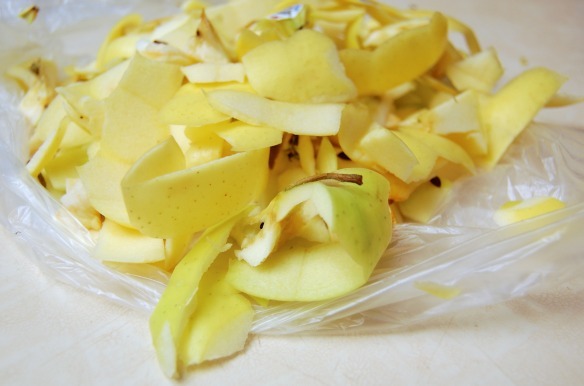 Peel apples and cut into large chunks. Place apples in a large saucepan with water. Bring to boil over high heat, stirring occasionally. Reduce heat, cover pan and simmer gently for 20 minutes, or until apples are tender, stirring once or twice. Remove from heat. Drain off approximately 3/4 cup of liquid and set aside. 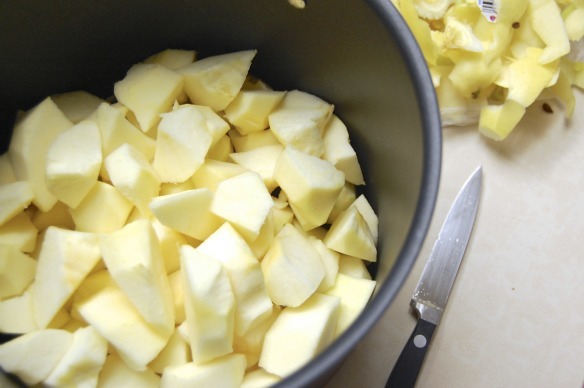 Mash apples with a potato masher. Stir in brown sugar and cinnamon. Reserved liquid, additional brown sugar or cinnamon may be added to sauce to achieve desired taste/texture. NOTE: I generally end up adding all the reserved liquid back because it seems to reabsorb as it chills. You can serve it at any temperature, but I prefer cold applesauce. The water can be replaced with apple juice (Martinelli’s is best!) for extra flavor. ATTENTION: 90 days until Christmas! Three months from today is THE day. I am almost tempted to wear my Charlie Brown Christmas tree t-shirt or the one that has a Rudolph nose that actually glows red. Needless to say, Christmas and I have a tight relationship. I listen to Christmas music the minute it becomes socially acceptable (no, tolerated…) and look forward to Christmas craft magazines hitting the shelves. In order to celebrate the nearness of Christmas without overwhelming people with yuletide cheer, I am expressing my enthusiasm via today’s salad recipe. The original recipe came from Southern Living, but it’s been long enough since my family first tried it that I don’t remember whether Christmas-Eve Salad was the original name or became the name after we ate it on said date. My mom has tweaked it over the years and now it’s a go-to in our salad repertoire. In fact, it was the first meal I made for The Hubs in our new place! The colors are festive and there’s enough protein from bacon and cheese to make it a light entree. A note on the cheese choice: string cheese may seem like an odd option, but it creates the perfect size pieces of mozzarella with little hassle. Plus, the discs add visual contrast to the otherwise diced ingredients. Salty bacon, creamy avocado, and toasty walnuts are what set this spinach based salad apart. Not only do the colors reflect the festive season, the ingredients truly create a holiday in your mouth. The ingredient amounts listed below reflect my preference for salads with a pretty even greens to mix-ins ratio. Feel free to play around to get it perfect for your salad palette. Cut bacon strips into 1/4 inch wide pieces. Fry until crispy. Let excess grease drain off on paper towels. Toast walnuts in a skillet over medium heat. Stir occasionally. Remove from heat when they become fragrant and lightly browned. Let cool while you prep other ingredients. Chop spinach. Dice red pepper and peeled avocado. Cut tomatoes in half, discarding seeds if desired. Unwrap string cheese. Slice horizontally to create thin discs. Chop cooled walnuts. 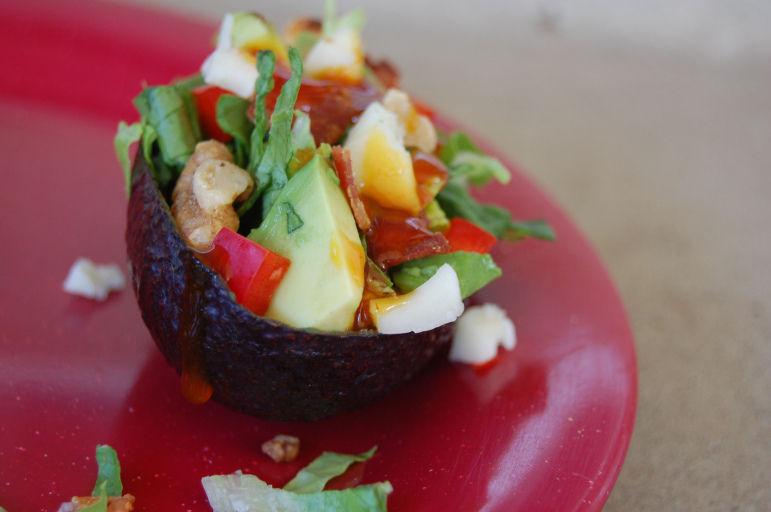 Place spinach, red pepper, avocado, tomatoes, string cheese, walnuts, and bacon in a serving bowl. 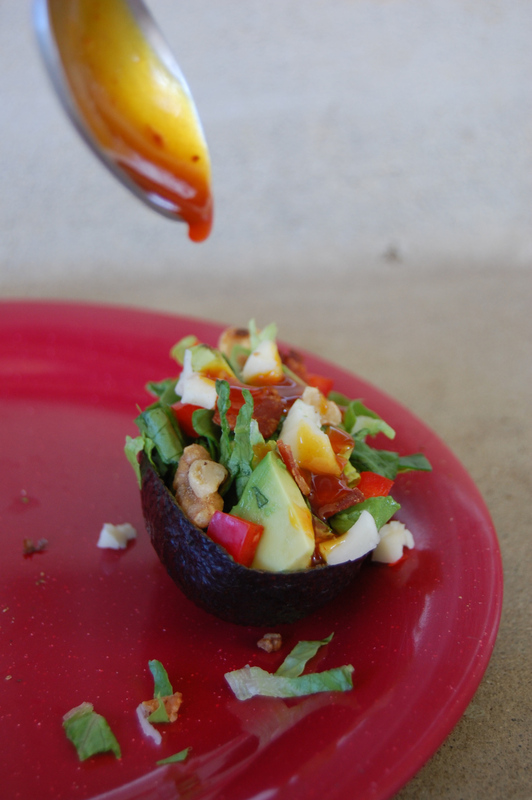 Toss with Catalina dressing.